The inclination to recede into the background was an ingrained character trait, and one that also attended Lloyd in the pharmaceutical business, where he made his fortune. Here, his efforts to build the family pharmacy chain into a national leader in drug wholesaling were overshadowed by the celebrity of his brothers, the once-famous scientist-novelist John Uri Lloyd (1849-1936) and the noted mycologist Curtis Gates Lloyd (1859-1926). But the unassuming other Lloyd brother “had his passions, his interests [and] places where he left his mark,” as well.3 Among those passions was baseball, where Ashley Lloyd made the modest but constructive contributions to the national pastime that will be recalled in the paragraphs below. Nelson Ashley Lloyd was born on November 17, 1851, in Lima, New York, a small town about 25 miles south of Rochester.4 He was the second of three sons born to merchant/civil engineer Nelson Marvin Lloyd (1820-1882) and his wife, Sophia (née Webster, 1820-1903), a descendant of lexicographer Noah Webster. When Ashley [as he preferred to be called] was just a toddler, the family moved to Boone County, Kentucky, a place later memorialized in brother John Uri’s novels. Growing up near the Ohio River, Ashley aspired to the life of a river pilot, but was persuaded by his parents to follow in John Uri’s footsteps and apprentice to a Cincinnati pharmacist.5 By 1876 John Uri and Ashley were on their own and operating a laboratory “for the study of plant material medica.”6 A short time later, they merged that venture with H.M. Merrell & Company, a wholesale drug company in Cincinnati. John Uri, a self-taught pharmaceutical genius, remained in the lab, while Ashley took to the road to drum up business. In time, youngest brother Curtis, a botanist who would go on to do pioneering work with mushrooms (mycology), joined the firm. Notwithstanding the mismatch in the temperaments and interests of its founders, Lloyd Brothers was a rousing financial success, yielding the three brothers the means to lead well-heeled lives. In Ashley’s case, that life included marriage. In March 1877, he had taken 24-year-old Olive Augusta Gardner (1852-1930) as his bride. The birth of daughter Marcia in 1882 completed the family. For most of their married life, the Lloyds lived in either Norwood or Walnut Hills, upscale Cincinnati enclaves. Somewhere along the way, Ashley developed a passion for baseball, an interest first publicly recognized around 1890. That year was a turbulent one for major-league baseball, with the upstart Players League wreaking havoc with the established National League and the struggling-to-survive American Association. During the early-season going, Cincinnati sportswriter Ren Mulford Jr., captured the sentiments of “Ashley Lloyd of the wholesale drug firm Lloyd Brothers” on the unhealthy situation. “The dear public will stand a good deal,” cautioned Lloyd, “but sometimes it gets a stomach full and lies down.”11 At a Reds-Giants game two months later, Lloyd, “one of Cincinnati’s biggest enthusiasts,” was the guest of Giants club founder/owner John B. 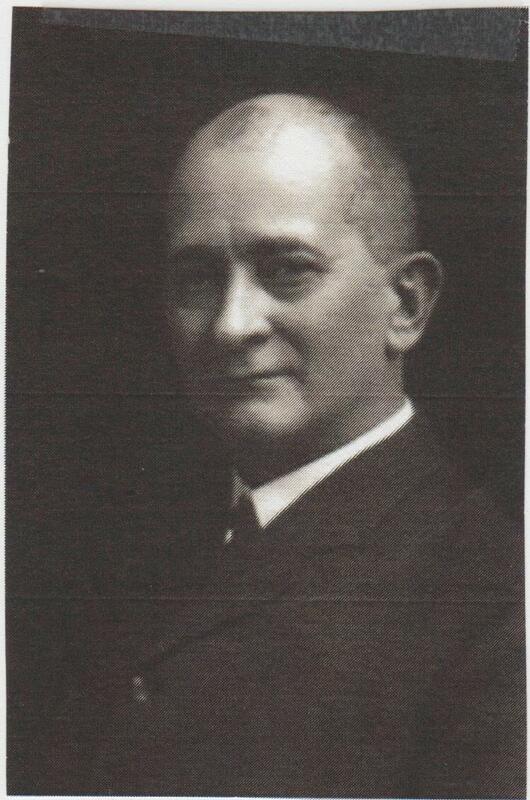 Day and John T. Brush, president of the just-liquidated Indianapolis Hoosiers franchise.12 Brush, an Indianapolis department-store owner, was determined to remain in the game and on the lookout for allies. He found a valuable one in Ashley Lloyd. Personality-wise, the dour, guarded Brush was the polar opposite of the genial Lloyd. But the two capitalists had much in common, including devotion to Scottish Rite Masonry. More importantly, Brush and Lloyd shared a passion for baseball. In short order, they became partners in the game and, in time, close friends. Brush had his eye on assuming control of the Cincinnati franchise, but the situation there was messy. Financially strapped Reds owner Aaron Stern wanted out, and relinquished his holdings to the National League. But when the PL folded at the close of the 1890 season, streetcar magnate Al Johnson, a financial angel of the Players League and anathema to NL moguls, made plans to place an American Association team in Cincinnati. For a nominal fee, the National League then conferred a franchise charter for Cincinnati upon Brush. In the ensuing battle for the venue, Johnson proved no match for the iron-willed John T. In less than a month, Johnson sold his franchise interest to the National League and departed Organized Baseball, leaving Cincinnati entirely to Brush. A sad-sack club headed by a faded Mike “King” Kelly was hastily installed in Cincinnati by the AA, but lasted only until August before relocating to Milwaukee. The American Association itself expired at the close of the 1891 season. For more on the death of AA ball in Cincinnati, see David Nemec, The Beer and Whisky League: The Illustrated History of the American Association – Baseball’s Renegade Major League (New York: Lyons & Burford, 1994), 222-224. As Brush had no immediate intention of uprooting himself from Indianapolis, he deemed it prudent to have local representatives with him in the venture. Among the Cincinnatians enlisted as junior partners in the new Reds organization was Ashley Lloyd. In addition to being a minority stock owner, Lloyd assumed the post of club treasurer. He was also one of the four locals on the five-member Cincinnati Reds Board of Directors, club president Brush being the other.13 During the ensuing 12 years of the Brush regime in Cincinnati, the Reds were a consistent also-ran in NL standings, much to the displeasure of local sportswriters. But Lloyd bore little responsibility for the Reds’ mediocrity, as his club duties were limited. He parleyed with Brush regarding franchise payroll, retained custody of player contracts and other financial instruments, and attended league meetings as part of the Reds delegation. As time wore on and Brush’s physical condition deteriorated – he began exhibiting symptoms of locomotor ataxia, a painful and irreversible wasting disorder, by the early 1890s and was often unable to travel – Lloyd became the Reds’ point man at NL gatherings. But he possessed little of the influence that the wily Brush exerted over attendees. Lloyd, however, was more useful when it came to dealing with the often-hostile press. He rarely said anything particularly revelatory, but was a reliable source for the anecdotes and filler material needed for copy during slow-moving news days – an attribute that made Lloyd almost universally well-liked by the local Fourth Estate. Even Ban Johnson of the Cincinnati Commercial Gazette, a relentless critic of Brush, had kind words. “When it comes to treating the boys cordially and giving them all the news there is, no one is better than treasurer Ashley Lloyd,” remarked Johnson.14 All the while, Ashley continued his duties with Lloyd Brothers, superintending the business side of the operation and building the brand name through work with various trade associations. Throughout his tenure as Reds boss, John T. Brush also held stock in the New York Giants, the franchise that he really coveted. In 1902 Brush sold the Reds to a consortium headed by Cincinnati city officials and fellow Masons: Mayor Julius Fleishmann, his brother Max, and Water Commissioner Garry Hermann, plus local Republican Party boss George B. Cox. In return for $150,000, Brush “handed over all the club stock except 1/20 he could not procure.”15 Brush promptly reinvested his king-sized portion of the sale proceeds into purchase of the Giants from the one club owner whose press was worse than his own, the wealthy Tammany politico and baseball dilettante Andrew Freedman. As in Cincinnati, Brush’s junior partner in New York would be Ashley Lloyd, by now a trusted friend as well as a business associate. Lloyd remained a Cincinnati-area resident, and at first held only a seat on the board of directors of the National Exhibition Company, the Giants’ corporate alter ego. Having achieved his baseball ambition, Brush left roster and game-related decisions entirely to Giants manager John McGraw, and reaped the benefits in both the standings (NL pennants in 1904 and 1905, and a World Series crown the latter year) and at the turnstiles (the Giants set NL attendance records, drawing a then-remarkable 910,000 fans to home games in 1908). But as Brush’s health continued its downward slide – he was mostly confined to a wheel chair by 1905 – he began to groom son-in-law Harry Hempstead as his successor.16 Still, Brush’s trust in Ashley Lloyd remained steadfast, and he designated Lloyd co-executor of his estate.17 The end for John T. Brush came in late November 1912 at age 67. Under the terms of the will, Brush’s controlling interest in Giants stock was split three ways, with equal shares going to his widow, second wife Elsie Lombard Brush, his teenage daughter Natalie, and his older daughter Eleanor Hempstead. As the Brush family women had no interest in running the franchise, club operations were left to Eleanor’s husband, Harry Hempstead. Hempstead was formally installed as club president at a franchise reorganization meeting held in January 1913. Among the other changes to the Giants front office was the installation of Ashley Lloyd as club treasurer.18 Although born a generation apart, Hempstead and Lloyd were kindred spirits: quiet, honorable men of sound, if cautious, judgment, and they got along well. Like his late father-in-law, Hempstead entrusted personnel and game-related decisions entirely to manager McGraw. But unlike John T. Brush, Hempstead did not seek McGraw’s advice on business matters, much to Little Napoleon’s chagrin. Here, Hempstead relied on the counsel of Lloyd and club secretary John B. Foster.19 Guided by their advice and his own conciliatory inclinations, president Hempstead urged accommodation of player proposals and moderation in the battle with the Federal League during National League owner councils. Usually in attendance and faithfully seconding the Hempstead stances was Ashley Lloyd. Although Lloyd remained a Giants stockholder, the club’s front office was overhauled by the Stoneham regime. Installed as club treasurer was city magistrate Frank McQuade, a new minority stockholder in the Giants. Lloyd’s active involvement in the game had come to its end. But he remained engaged in the business and civic life of his adopted hometown, Cincinnati. With his brothers often busy with other pursuits, it was Ashley who managed operations at Lloyd Brothers. He was also instrumental in the founding of the Lloyd Library and Museum, today the largest repository of pharmaceutical texts in the world.24 He served on various local improvement commissions, but declined an invitation to stand for Cincinnati mayor. Lloyd was also an orphanage trustee, a bank officer, a philanthropist, and an art collector. And from afar, he followed the fortunes of the New York Giants. Early in 1925 Lloyd was taken ill, and pneumonia quickly set in. He died at his home in Walnut Hills on January 17. Nelson Ashley Lloyd was 73. Following funeral services, he was interred at Spring Grove Cemetery in Cincinnati. Survivors included his wife, Olive Gardner Lloyd; daughter Marcia Lloyd Mills; and brothers John Uri and Curtis Lloyd. Shortly after Ashley’s passing, the board of directors of the Cincinnati Children’s Home published a lengthy tribute which ended: “To know him was indeed to love him, for he was one who loved his fellow man.” Lloyd was also remembered kindly by baseball as “one of the most modest participants in the national game and one who studiously withdrew from the gaze of the public, Mr. Lloyd was one of the biggest men who ever had a vote in National League affairs. … His word was unquestioned and his opinion frequently turned the scales in the politics of the organization.”25 However overstated the memorial, Ashley Lloyd had been a positive contributor to the national pastime, and his time in baseball was only one part of a long and useful life. This biography is adapted from an article originally published in the June 2015 issue of "The Inside Game," the newsletter of SABR’s Deadball Era Committee. Sources for the biographical detail contained herein include The Lloyd Brothers, accessible online via lloydlibrary.org/history/lloyd_brothers.html; John S. Haller Jr., Medical Protestants: The Eclectics in American Medicine, 1825-1939 (Carbondale, Illinois: Southern Illinois University Press, 1994); family tree info posted on Ancestry.com; and certain of the newspaper articles cited below. 1. See “In Memoriam: Nelson Ashley Lloyd,” Spalding Official Baseball Guide, 1926, 343. 2. See George Chadwick, Consolidated Press Syndicate column published in the Oakland Tribune, December 6, 1925, San Diego Union, December 8, 1925, and elsewhere. 3. Quoting The Lloyd Brothers, 3, online at lloydlibrary.org/history/lloyd_brothers.html. 4. Although some sources place Lloyd’s birthplace as Bloomfield, New York, Lima was listed as his birthplace by Lloyd himself in the notarized passport applications he submitted in 1908 and 1912, and Lima was noted as his birthplace on his death records. 5. As later recalled by Ashley in remarks before the Roastology Club of Cincinnati. See the Cincinnati Post, January 2, 1900. 6. John S. Haller Jr., Medical Protestants: The Eclectics in American Medicine, 1825-1939 (Carbondale, Illinois: Southern Illinois University press, 1994), 184. 7. Pharmacognosy is the study of medicine derived from herbs and other natural sources. 8. The Lloyd Brothers, 2. 10. The Lloyd Brothers, 3. 11. Sporting Life, May 8, 1890. 12. As noted in Sporting Life, July 5, 1890. Brush’s Indianapolis club had been eliminated as a preemptive wartime measure by the league, but he was promised the next available NL franchise. In the meantime, Brush remained a member of the NL owners council, and held a minority stake in the financially troubled New York Giants, having converted a $25,000 note from Day for Indianapolis players sent to the Giants into a piece of New York club ownership. 13. As reported in the Cincinnati Post, Cleveland Plain Dealer, and Kansas City Times, March 31, 1891, and elsewhere. At the close of their inaugural season together, it was reported that “John T. Brush is still in command, but it has been proved that Cincinnati needs a local head of offices. Ashley Lloyd, the wholesale druggist, has more money in the business than any other Cincinnatian.” (Rockford) Illinois State Journal and Bay City (Michigan) Times, October 11, 1891. 14. Sporting Life, December 29, 1892. 15. According to the New York Times, August 10, 1902. 16. In 1894 Hempstead married Eleanor Gordon Brush, John T.’s elder daughter by his first marriage. Hempstead later assumed responsibility for Brush’s business interests in Indianapolis, freeing Brush to concentrate his attention on the Giants. Although a stranger to most Giants fans, Hempstead sat on the franchise board of directors from early 1903 on. 17. Brush’s unswerving confidence in Lloyd was noted by sportswriter Ren Mulford. See Sporting Life, December 21, 1912. The other co-executor was Harry Hempstead. 18. As reported in the Chicago Tribune, Trenton Times, and newspapers nationwide, January 7, 1913. 19. In his memoir, McGraw remembered Brush fondly. Hempstead, Lloyd, and Foster went unmentioned. See John J. McGraw, My Thirty Years in Baseball (New York: Boni & Liveright, 1923). 20. As noted in the Washington Evening Star, November 13, 1915, Denver Post, November 22, 1915, and elsewhere. 21. As quoted in the Grand Forks (North Dakota) Herald, December 18, 1915. 22. As reported in the New York Times, January 13, 1916, The Sporting News, January 16, 1916, and elsewhere. 23. At the time, the Giants purchase price was generally put at $1 million. See, e.g., the Chicago Tribune and New York Times, January 16, 1919. Later, Giants historians raised the franchise price tag to $1.3 million. See Tom Schott and Nick Peters, The Giants Encyclopedia (Champaign, Illinois: Sports Publishing, Inc., 1999), 90. Dominant syndicate member Stoneham acquired 1,300 shares in the club. Junior partners McQuade and John McGraw bought 70 shares each. Eleanor Brush Hempstead retained her piece of Giants ownership until June 1924, when she sold out to former St. Louis Cardinals stockholder Warren “Fuzzy” Anderson, as reported in the New York Times, June 13, 1924. 24. As per Christopher Hobbs, “The Lloyd Library: The Unknown Alexandria of Herbal Medicine,” online at healthy.net. 26. Lloyd Brothers, 3. 25. “In Memoriam: Nelson Ashley Lloyd,” Spalding Official Base Ball Guide, 1926, 343.